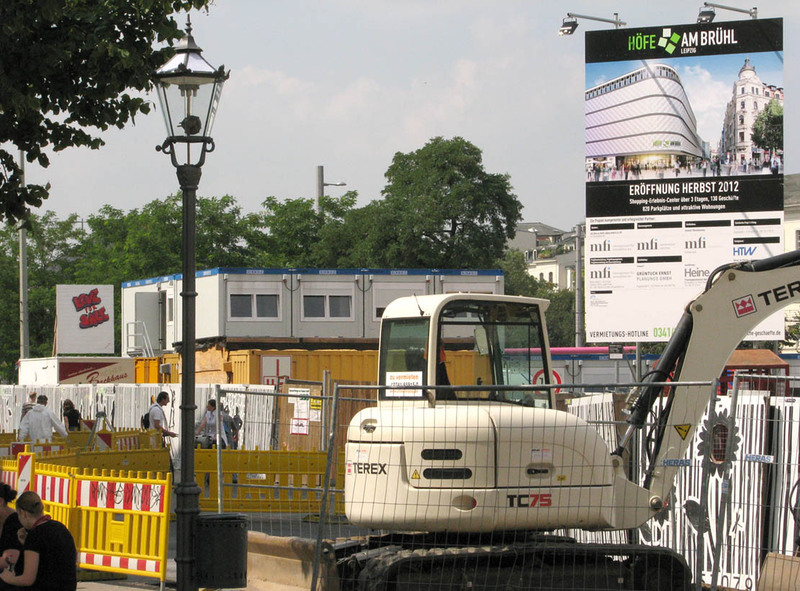 The construction of the "Höfe am Brühl" is the inevitable emergence of a consumer temple on a commercial street. Commercial activities at the present are defined by more than material goods and has reached areas, which are formed, controlled and developed by digital information. The commerce of real products is increasing promoted with adventure, greed, and flavor enhancers. After the conquest of the globe in recent times the cosmic space becomes a subject of commerce. A few non-negotiable, but nevertheless vital goods defy the ubiquitous commercial instinct of the people, natural phenomena, for example, happiness or love. 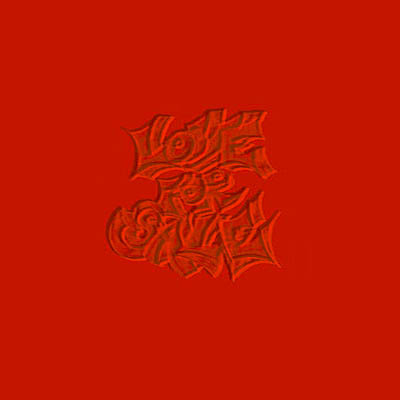 The fact that you can not buy love, is a bastion, which will resist the smartest trading activity of man. Also along the Via Regia they made money based on false promises. With such trade in recent times you can change resistant properties and events into money. This feature of the market, everything, including non-tradable, incorporate to market, is an aspect that object deals with. 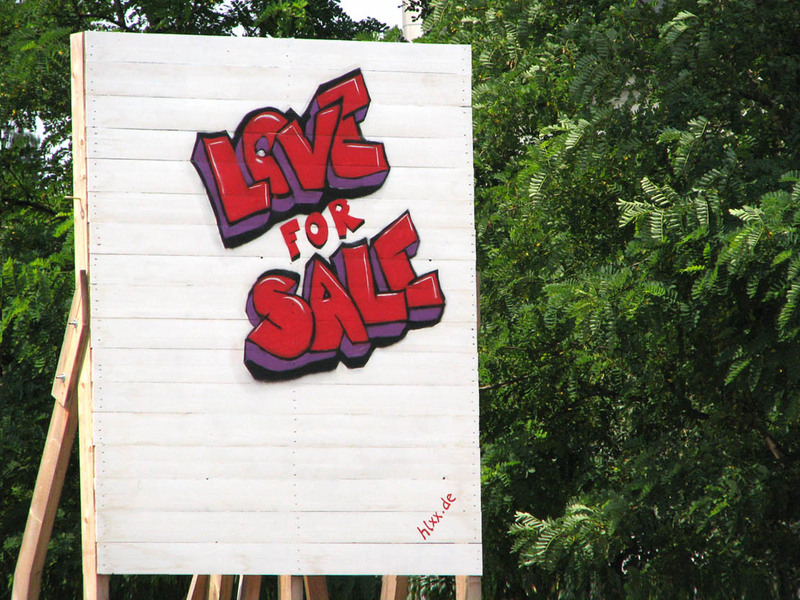 On the white area of a construction sign the slogan: LOVE FOR SALE is sprayed. This slogan seems out of place and misleading, because he is published on a wrong place and claims incongruous. The slogan is always associated with a region of urban life, whith a prosperous trading center, that is pushed as far as possible possible to the periphery, where it is banned from the public attention. 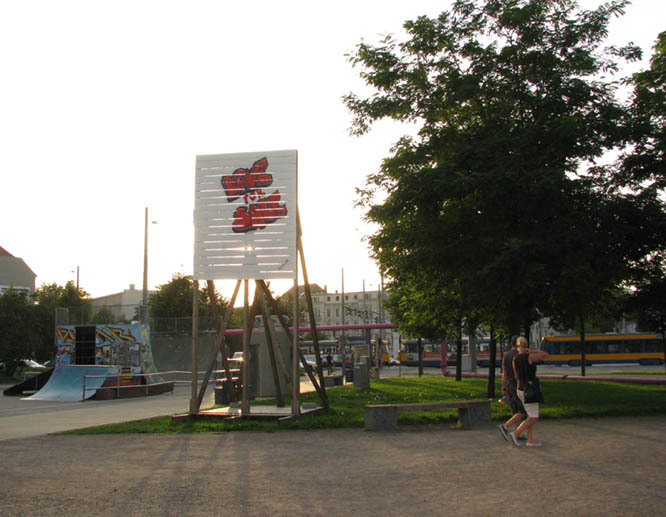 That this slogan is now located in the city center should receive special attention. The object is for accentuate the structure of the market, the never to reach endpoint of development of trade. It´s not including the commonly understood trade of the Red Light district. 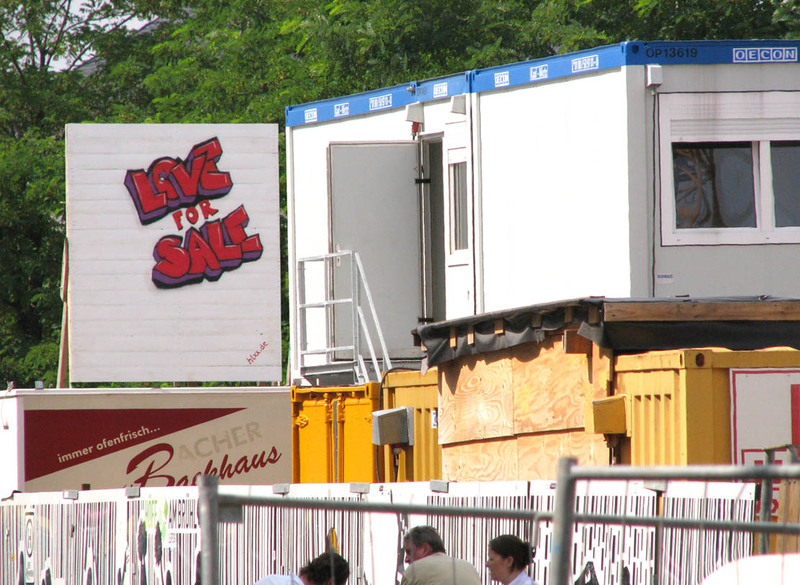 LOVE FOR SALE is a temporary intervention in a prominent place on the Via Regia. It refers to the modern, gentle and brutal seduction of the market, to the power of his opportunities and temptation and blatant ambiguity of its offers.